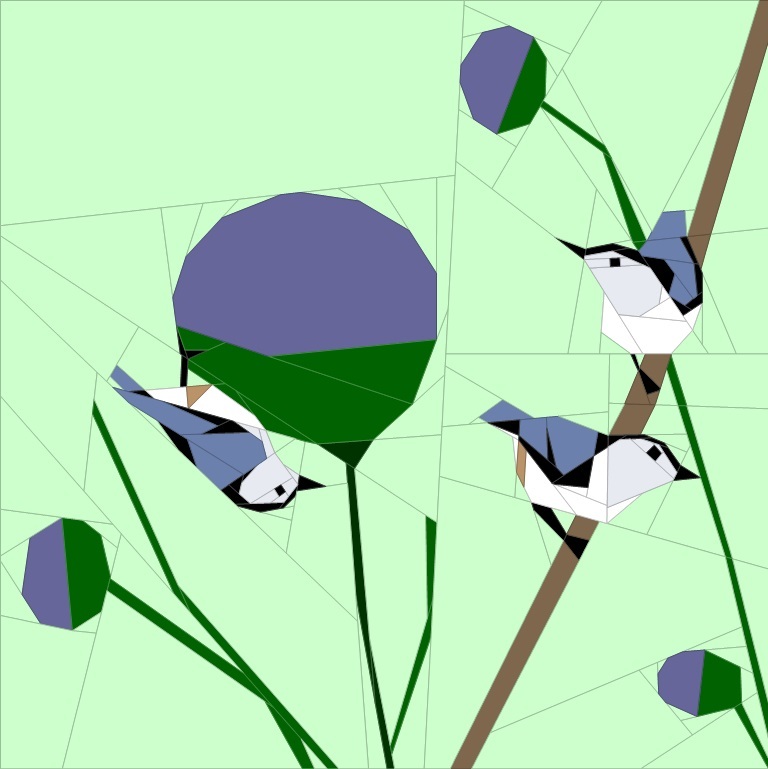 As you know we were going to make birds with a Charley Harper influence to them. I woke up Saturday to an email from the Charley Harper Art Studio saying that a concerned collector saw our blocks and 'told on us' and now we cannot make our quilt anymore... The bird images where we took the inspiration from are licenced to someone or other who will be miffed. but I thought about it and decided its all good and we won't make any blocks with another artists look or feel anymore. Not a problem. Soooo sorry to the concerned collector who was worried I might make money off a few quilt blocks. If you have already made the first 3 using the old patterns then by all means carry on with them. You did receive them for free and you've sewn them up, so they're good. Please don't send your friends copies of those patterns - we need to respect the CH Art Studio wishes too. 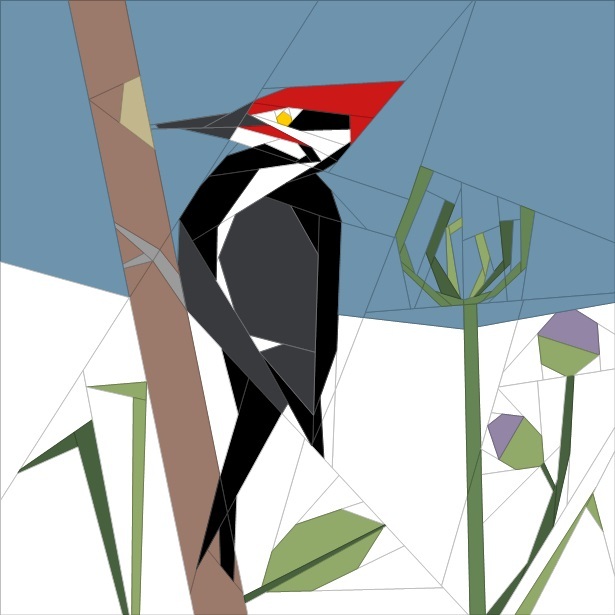 and replaced the March block with a different Woodpecker. I'm also only going to give the one colour option for the blocks but not add the colour codes to the pattern so you will still be able to make your 'Brights' colour blocks if you like. It just makes the PDF too big. The January and February BOM blocks are also done but I just need to finish them up. They are also still the Vireo and the Nuthatch birds but are now done with the Janeen van Niekerk art style. These blocks will be done from photographs and drawing that I have and made and combined together. 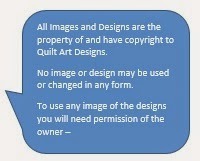 What a pity that people believe they have to be quilt / design police. I absolutely love your blocks - both the original 3 as well as your reworked versions. Thank you for the awesome patterns you share with us. Carry on, Janeen! 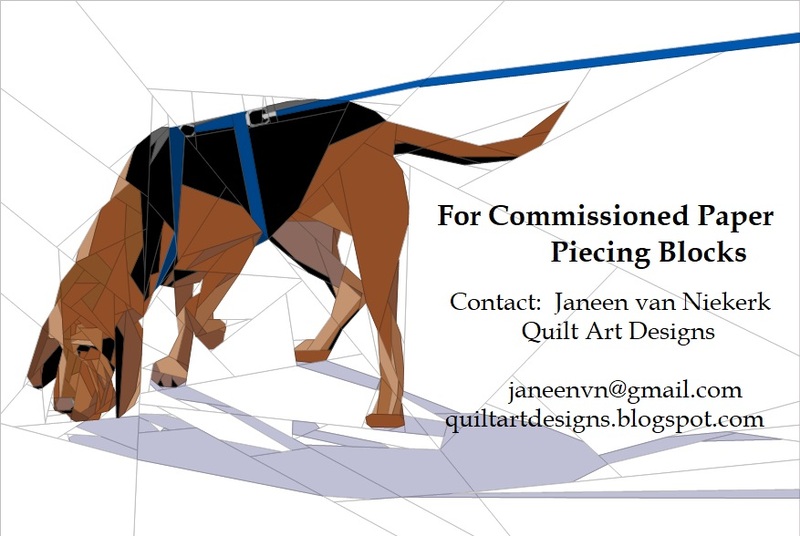 I love and admire the Janeen van Niekerk art style! Thank you for sharing your talents! What a pity this has happened. It was so clear that the blocks were inspired by Charley Harper, and not meant to be copies. It is a strange world. You must have worked hard to already have replacements for three months! And the new blocks look great too! We'll continue to enjoy your work. Ohhhh & "The Purple Ball Flower"
Your new blocks look wonderful! Thanks for sharing your talent and hard work in coming up with them! I have those flowers, ballon flower.. (if this is what you have...Platycodon). One of my favorites. I did look and see that Charley Harper studio is selling their own quilt patterns now, so maybe that is why their policy changed. Your new birds look amazing, though, so thank you! well ... I like your birdies better!!! and I lurve the alliums!!! Your new blocks are lovely. Thank you so much. Bummer... Anyways, I actually like the Quilt Art Designs version of the bird blocks better. I am also very excited about future projects. You made a lighthouse pattern on a rocky coast a while ago (I forgot how the lighthouse is called, but I believe it is on the Eastern Canadian coast). Would it be possible for you to make a coast themed pattern, let's say with pelicans or something like that on a pier? That would be great! 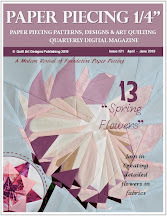 I love your style Janeen and the replacement blocks are in my opinion even nicer than the original so we'll all continue to follow you and appreciate your generosity to the quilting world! Thanks again! Thanks, Janeen, for all your wonderful designs and hard work! Thanks for all the patterns that you work so hard to make. I'm looking forward to all the JvN bird blocks. Thank you once again. The new blocks look great and I look forward to making them. I just love your replacement blocks - they are absolutely wonderful! 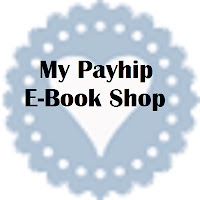 Thank you so much, it is a pleasure following your blog and now your Facebook Group. In my opinion you should have kept going and left the blocks up. Work inspired by other artists is not plagiarism after all. And if your birds were in no way copies but translated the aesthetics of Harper then so what? I do understand however that the potential legal hassle that might have followed is something anyone would want to avoid. Thank you for all the work you are doing, Janeen! I can understand, that you were all upset at first. But you know what? I like the "new" look of the Blocks even more. So, I am looking forward to all the blocks, that are coming. Merci pour ce joli pic vert et pour tout ce travail. I love your new blocks so much. The little chickadees are playful and awe inspiring. Thank you so much for sharing your talent! I know how disappointing this is. But I am glad you took the high road. I just wonder if the person who was concerned you were going to make money off of these patterns, would even have noticed if you hadn't called them inspired by Charley Harper. At any rate, I like the new patterns just as well and am thankful you are continuing the BOM. I have always liked your designs. What a shame this happened Janeen; even though you knew in your heart that you weren't copying, obviously others felt threatened. I do love your new designs though and look forward to sewing them up - I have just about decided on what fabrics I'll be using for this sal. I think Yvonne Chen has a great suggestion for a coastal or seaside series of blocks! I think your giraffe has the most adorable expression! It is definitely on my to-do list! Have you published a zebra pattern? I really hate when this happens! 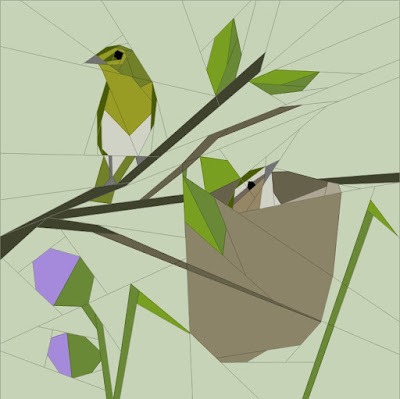 Everyone on your site knew that they were by no means copies of Charley Harper's designs, and I would bet that he was never informed about this small group of quilter's making this project. I really wish someone would show him the blocks and explain to him that you offer these blocks free for the first month. I'm betting he would let it continue. I think that you should send him your design work and process, his signature required, to just let him know about it, not requesting anything, just showing him how they were designed by you, not copied by you.